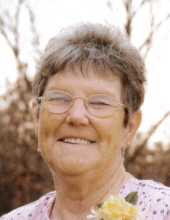 Leona D. Allison, of Rolla, passed away Friday, March 22, 2019 at the age of 80. She was born on July 16, 1938 in Vienna, MO to the late Edwin Daniels and Bertha (Riley) Daniels. On December 29, 1956, she married Harold Fred Allison in Rolla. He preceded her in death on July 30, 2015. In addition to her parents and husband, she was also preceded in death by a son-in-law, Darryl Pearson; sisters, Betty Eilman, Delores Hale and Cathy Tennyson; and brothers, Everett Daniels, Burke Daniels, Leon Daniels and Paul Daniels. Leona was a charter member of the Rhea Saddle Club. She was a member of the Rhea Church of Christ for many years. She loved fishing, going to bluegrass festivals with Fred and spending time with family. Leona will be greatly missed by her surviving family which includes: her sons, Jimmie Allison and wife Lisa and Travis Allison, all of Rolla; one daughter, Theresa Pearson of Rolla; a brother, Jimmie “Bob” Daniels and wife Noreen of Rolla; one sister, Kay Evans and husband Arnold of Rolla; eight grandchildren and thirteen great grandchildren. A funeral service for Leona D. Allison will be conducted at 10 a.m. on Wednesday, March 27, 2019 at the Null and Son Funeral Home in Rolla. Interment will follow in the Rhea Cemetery. A visitation for family and friends will be held from 6-8 p.m. on Tuesday, March 26 at the funeral home. Memorial contributions are suggested to the Rhea Cemetery. To send flowers or a remembrance gift to the family of Leona D. Allison, please visit our Tribute Store. "Email Address" would like to share the life celebration of Leona D. Allison. Click on the "link" to go to share a favorite memory or leave a condolence message for the family.